We have all been on Maths of the Day training tonight and are very excited to try out what we have learnt in school. Maths of the Day, is all about making maths fun and also increasing the amount of physical activity children are doing each day. The next generation of children (your children) are growing up in an indoor world and the amount of physical activity that most children do now is significantly less that it was 10 years ago. The scary thing is that research has proven that the current generation of children are likely to live 5 to 10 years less than us as a result. Look out for more information coming soon about how you can help at home and increase the amount of time your child is active for. Due to the snow last week, our World Book Day event will take place on Monday 12th March 2018. ​All children can come to school dressed as their favorite book character. Parents are invited into school from 2pm. ​In assembly today, we have introduced the concept of Bucket Fillers and Bucket Dippers. Everyone in our school will be practicing being bucket fillers! The concept of being a bucket filler comes from Carol McCloud’s Book Have You Filled A Bucket Today? and stems around the idea that everyone carries around an invisible bucket that, throughout the day is being filled by the kind things that you do for others or that others do for you. A bucket filler is someone who is showing positive character traits (kind, considerate, caring, respectful) and is being a responsible citizen. When our buckets are full, we feel happy and when our buckets are empty we feel sad. For the next few weeks, we will be learning about different qualities that bucket fillers and bucket dippers exhibit. 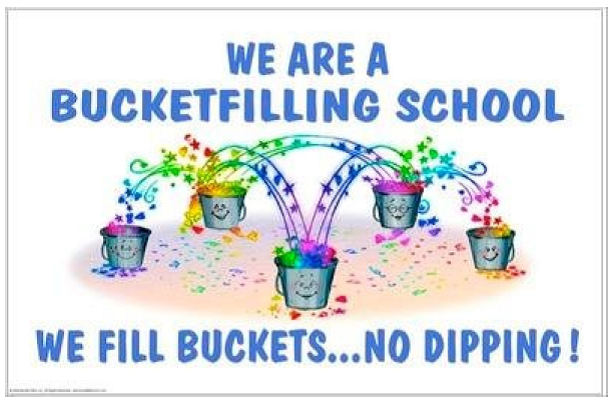 We will be practicing being a bucket filler in the classroom, and encouraging children to be bucket fillers at home. It is very important that this concept is carried over into children’s home lives. You can help your child be a bucket filler by discussing the concepts at home. You can praise your child at home when they do something that fills your bucket or someone else’s bucket. With you help, I hope that we can create a positive, happy, bucket filling school and community! We are currently in the process of rebuilding our site to make it more user friendly and information easier to find. Please bear with us, this process won't take long and some fresh, new images of our school will be available to view soon. We value your comments and feedback on any improvements or changes we can make, so please feel free to get in touch using the contact us page.